1. Keep Christ first in your life. Yield to Him daily and confess all known sins (I John 1:9; John 15:5; Philippians 4:13). 2. Read your Bible daily. Start in the book of St. John (I Peter 2:2; Revelation 1:3). 3. Pray often -- talk to God from your heart. Thank Him for saving you and for other blessings. Take your needs and problems to Him also (Philippians 4:6,7). 4. Fellowship with other believers. Attend a church that teaches and practices the Bible (Acts 2:42; Hebrews 10:25). 5. 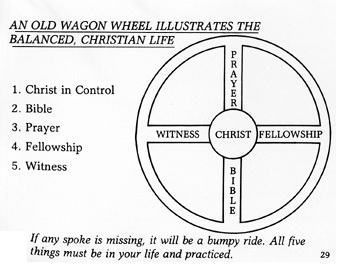 Witness for Christ. Tell others what Christ has done for you (Matthew 10:32; Mark 8:38). To enroll in a free Bible correspondence course that will help you grow in your Christian life, complete and submit the following form. The Purpose: It is a physical picture of a spiritual fact. When you are baptized, you are testifying that God has applied the death, burial, and resurrection of Christ to your life. The Time: In the Bible, as soon as a person received Christ, he was baptized (Acts 2:40,41; Acts 8:25-40). The Method: Being lowered into the water and then being raised up again, is a picture (illustration) of the death, burial, and resurrection of Christ. Would You Like to Witness for Christ by Being Baptized This Week?